Autonomous Control Systems Laboratory Ltd. The history of drone dates far back. Human in those days must have had a yearn for the sky. 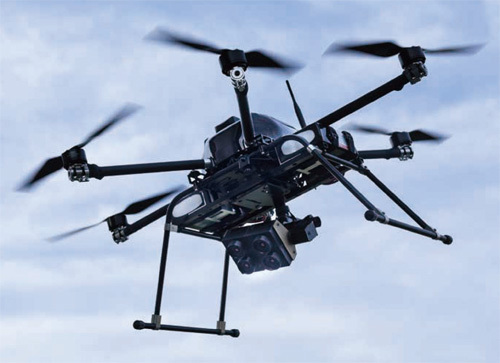 This article first gives an overview of the history of research and development of drone including fixed wing and rotary wing, followed by, in particular, the history of development of rotary wing drone with the following four periods: before 1990 when radio control is at its dawn period; 1990 to 2010 when drone is at its dawn period; 2010 to 2015 when hobby-use drone is at its spread period; and 2016 and after when industrial-use drone is at its dawn period to growth period. In addition, this article presents the Japanese government’s roadmap, followed by a five-stage class of drone in terms of flight level and autonomy. In particular, autonomy will be discussed from the points of view of guidance, navigation, and control. Then with reference to an ideal state of drone in future, the article will discuss importance of the guidance system by fault tolerant control and supervisor control with implementation of the AI technology and the like. Full text (7.1MB) (free) Please log in. K. Nonami, “Research and Development of Drone and Roadmap to Evolution,” J. Robot. Mechatron., Vol.30, No.3, pp. 322-336, 2018. Q. Quen, “Introduction to Multicopter Design and Control,” Springer, 2017. E. N. Johnson and D. P. Schrage, “The Georgia tech unmanned aerial research vehicle: GTMax,” Proc. of AIAA Guidance, Navigation, and Control Conf., Austin, 2003. R. J. Wood, “The first takeoff of a biologically-inspired at-scale robotic insect,” IEEE Trans. on Robotics, Vol.24, No.2, pp. 341-347, 2008. G. Cai, B. M. Chen, and T. H. Lee, “Unmanned Rotorcraft Systems,” Springer, 2011. N. Michael, D. Mellinger, Q. Lindsey et al., “The grasp multiple micro-uav testbed,” IEEE Robot Autom. Mag., Vol.17, No.3, pp. 56-65, 2010. T. Hamel, R. Mahony, and A. Chriette, “Visual servo trajectory tracking for a four rotor VTOL aerial vehicle,” Proc. of IEEE Int. Conf. on Robotics and Automation, Washington, DC, pp. 2781-2786, 2002. E. Altug, “Vision based control of unmanned aerial vehicles with applications to an autonomous four rotor helicopter, quadcopter,” Dissertation, University of Pennsylvania, 2003. S. Bouabdallah, P. Murrieri, and R. Siegwart, “Design and control of an indoor micro quadcopter,” Proc. of IEEE Int. Conf. on Robotics and Automation, New Orleans, USA, pp. 4393-4398, 2004. P. J. Bristeau, F. Callou, D. Vissire et al., “The navigation and control technology inside the AR. Drone micro UAV,” 18th IFAC World Congress, Milano, Italy, pp. 1477-1484, 2011. K. Nonami, “Exact Nonlinear Model, Uncoupled Linearization Model and Model Based Control of Unmanned Aerial Vehicles,” J. of the Society of Instrument and Control Engineers, Vol.56, No.1, pp. 3-9, Jan. 2017. K. Nonami, F. Kendoul, W. Wan, S. Suzuki, and D. Nakazawa, “Autonomous Flying Robots,” Springer, 2010. K. Nonami and S. Inoue, “Research on sub-committee of aerial robots of ImPACT/TRC,” J. of the Robotics Society of Japan, Vol.35, No.10, pp. 700-706, 2017. K. Nonami and H. Tian, “Sliding Mode Control,” Corona Publishing, 1994.